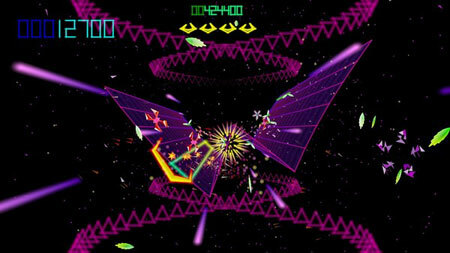 Tempest 4000 is a visually stunning, action-packed tube shooter developed by Llamasoft Ltd. It is based on the classic hit arcade game Tempest. The game remains faithful to the original fast-paced gameplay by putting you in control of the Claw, a powerful spacecraft equipped to destroy deadly creatures and other obstructions with rapid-fire shots on vibrant geometric prisms. Featuring fantastical graphical environments, 100 levels, three game modes, you must eliminate all enemies as fast as possible to survive and compete for the highest score on the leaderboards. If you get stuck in the game, check out the video walkthrough and gameplay for the game. This entry was posted in PC Games, Walkthrough and tagged Tempest 4000 Cheats, Tempest 4000 Game, Tempest 4000 Gameplay, Tempest 4000 Guide, Tempest 4000 Hints, Tempest 4000 Review, Tempest 4000 Solutions, Tempest 4000 Strategy, Tempest 4000 Tips, Tempest 4000 Walkthrough by Marvin. Bookmark the permalink.